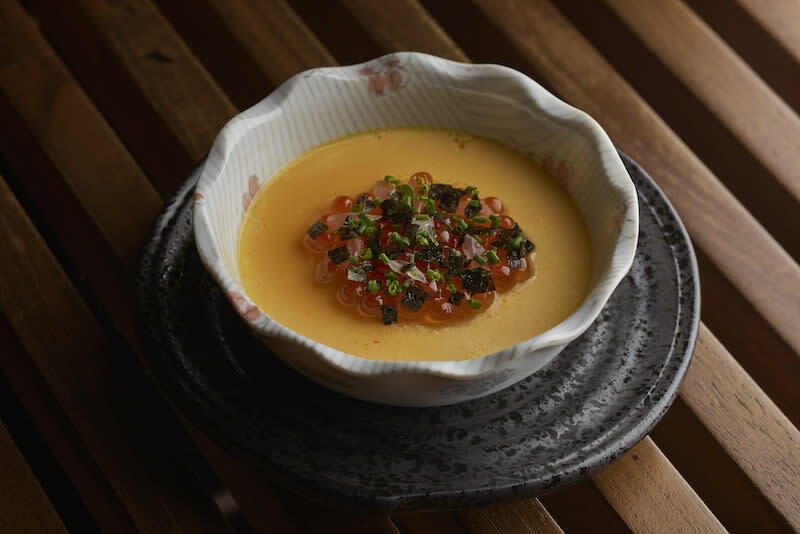 Keong Saik’s longtime izakaya holdout Neon Pigeon has introduced its new spring menu, and this time, the restaurant’s rolling out twelve fresh dishes themed to help its patrons forget about the (lack of) winter here. As per usual, Neon Pigeon head Chef Dennis Smit opts for a modern take on Japanese-inspired flavors with even more sharing platters. Appetizers start out silky smooth with the new Chicken Liver Mousse ($15/$28) or the Silken Uni Custard ($20/$38). 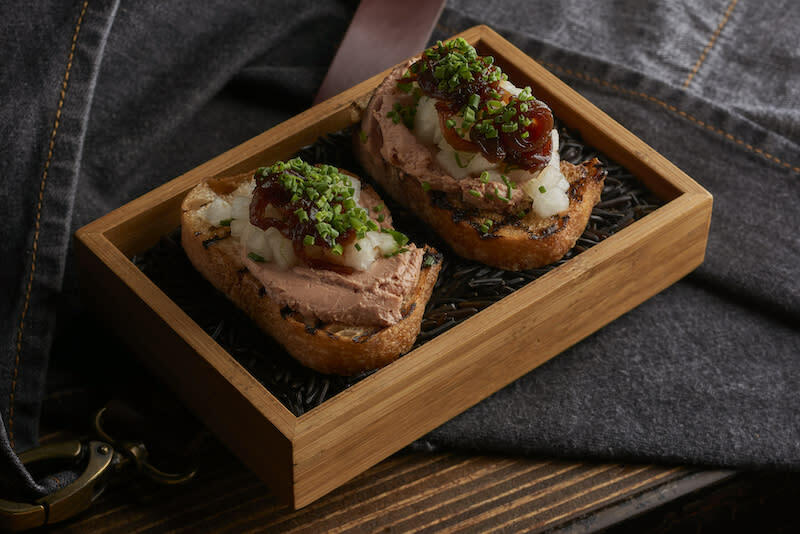 The former’s a bruschetta-style dish, with the delectable, creamy liver mousse meant to be spread onto lightly toasted bread and paired with a smear of nashi pear and tamari shallot jam; the latter’s a savory blend of uni topped with ikura, chives and nori flakes. 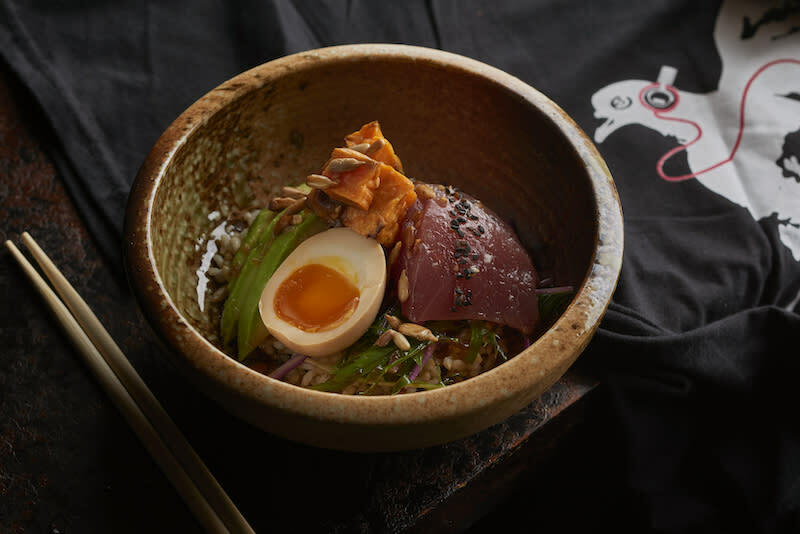 Those who want to get their raw fish on straightaway can go to town on the Tuna Sashimi Donburi ($16/$30), a dish that doesn’t hold back on heaping huge slices of the meat onto brown rice, sweet potato, sunflower seeds and, of course, a gooey-yolked, soy-soaked egg. Fried chicken is a classic for all seasons, but we’ll happily have it as a spring menu surprise. 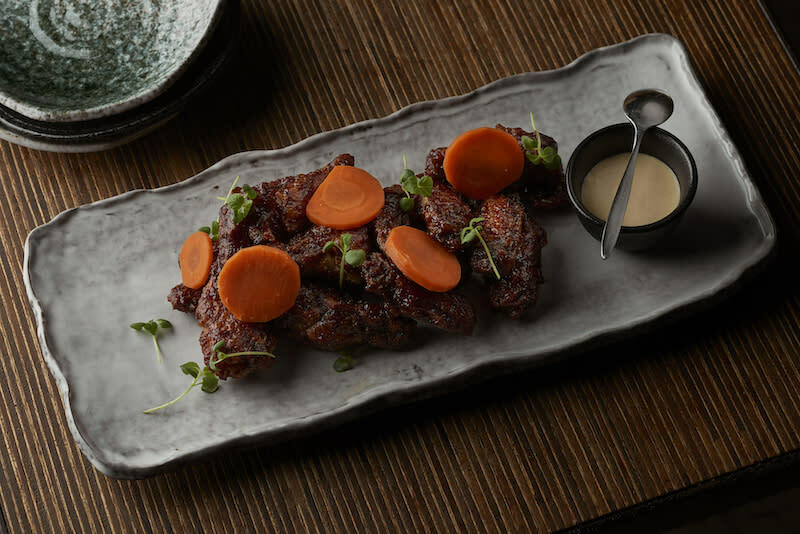 Neon Pigeon’s take on Fried Chicken Wings ($18/$38) hits you with the smoky double crunch thanks to the fusion of burnt miso and garlic dressing. It comes with preserved carrots too, if you want to take a break from the meaty flavor (you shouldn’t). To remind you that it is very much a (fusion) Japanese eatery, there’s curry rice… with a vegetarian twist. 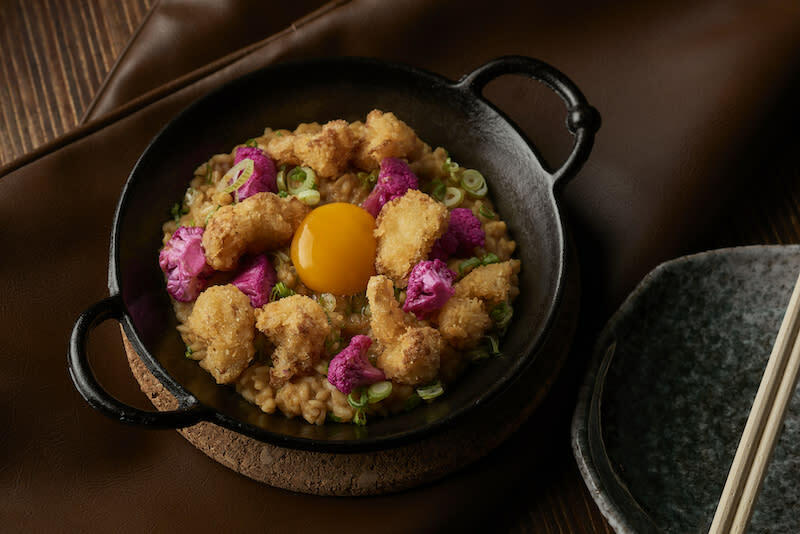 The Golden Curry Rice ($17/$32) replaces the meat with crunchy roasted cauliflowers, and the egg yolk perched atop it all fuses the curry-infused rice together with all the elements, resulting in a risotto-like consistency. On top of a rather voluminous array of sake, Neon Pigeon has recently expanded its drinks selection with new additions of red wine, including a full-bodied, fruity 2011 Le Menut des Jacobins (a Bordeaux-style blend from Saint-Émilion, France) and a lush, bright 2015 pinot noir from Ken Wright Cellars (Willamette Valley, Oregon). Open Mondays to Saturdays 6pm-12am; closed Sundays. 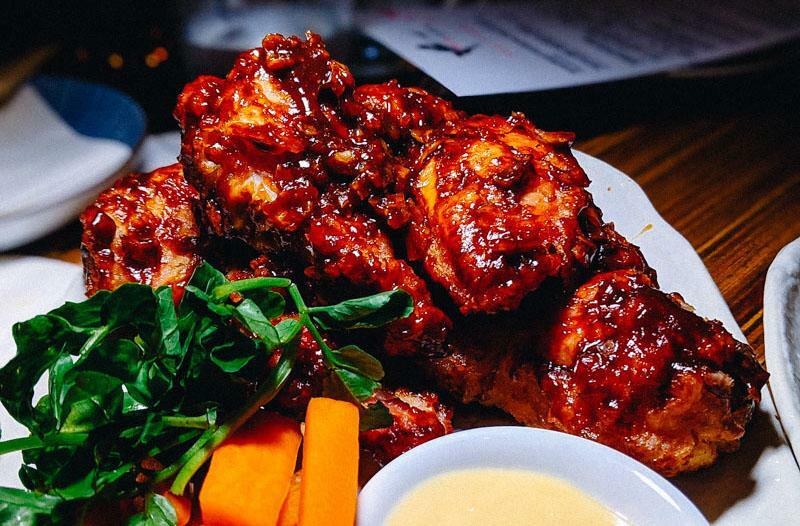 This article, Neon Pigeon’s new spring menu puts a toasty, homely spin on modern izakaya fare, originally appeared on Coconuts, Asia's leading alternative media company. Want more Coconuts? Sign up for our newsletters!